by Don Anderson, M.S.N., Ed.D., C.M.S.R.N. The American Assembly for Men in Nursing profiles the progress of its campaign for a 20% increase in the number of male nurses in the workforce by 2020. Through image marketing, research, and advocacy, male nurses are increasing their presence at the bedside as well as in today's culture. Mention the word "nurse" and who comes to mind? Maybe she's a nurse of antiquity, dressed in white, wearing a cap in the shape of a winged angel, holding someone's hand. Maybe she's wearing bright cheerful scrubs, running a hospital floor. She. This lasting female stereotype, many would argue, has served nursing well over the past century. Nurses are associated with the "feminine" qualities desirable in caregivers; they are nurturing, patient, even maternal. Yet, from the Nightingale-esque pictures that pop up in a Google Image search to the crowds of female nurses in every hospital-themed television show, these images reinforce a societal belief that nursing is, and should remain, a female-dominated profession. Indeed, the number of male nurses, practically the world over, still hovers between 5% and 10% of the nursing workforce. Today, while open degradation of minority social groups has lessened, male nurses continue to be ridiculed. The media is rife with recent examples, as male nurses remain fair game. For example, in the movie Meet the Parents, the main character is a male nurse named Gaylord Focker, carrying not-so-subtle connotations. During a recent episode of the popular television series Glee, lead character Sue Sylvester, an antagonistic cheerleading coach, says, "A female football coach, like a male nurse, is a sin against nature." Rather strong words, even for a joke. In 2002, the Oregon Center for Nursing (OCN) created a groundbreaking recruitment poster, the theme of which was "Are You Man Enough To Be a Nurse?" The poster was developed after the OCN surveyed middle and high school guidance counselors regarding male students and their attitudes toward men in nursing. Dr. Deborah Burton, Executive Director of the OCN at the time, says their mission became one of "let's see if we can find some stereotypically male practicing nurses who look male, act male, and love nursing. "1 Their highly acclaimed poster received widespread attention throughout the United States, and it's still buzzed about today. 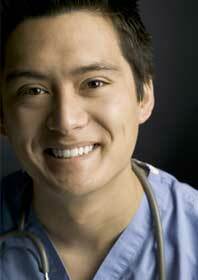 The OCN poster campaign and others since have helped create a dialogue between counselors and potential male nurses. The "Are You Man Enough to be a Nurse?" poster opened up a conversation surrounding masculine men becoming nurses. But that was just the beginning. At both the 2009 and 2010 American Assembly for Men in Nursing (AAMN) national conferences, attendees' feedback consistently noted a wish for more discussions concerning ways to change the image of men in nursing in both recruitment and retention areas. In 2009, the AAMN board of directors began discussing how to take its members' ideas to the next level. They believed nursing recruitment efforts needed to evolve from asking men if they were masculine enough to be a nurse to something less gender specific. They introduced the theme "Do what you love and you'll love what you do." In other words, the AAMN hoped to create an image of nursing focused on life interests instead of gender. This idea would eventually become the 20 X 20 Choose Nursing campaign, an effort to "de-genderify" nursing, making it a life choice in concert with someone's personal strengths and interests. After all, the ability to care, empathize, and nurture are not female-only personality traits. In the spring of 2010, the AAMN affirmed this decision in their five-year strategic plan by building the AAMN brand as "one that focuses on the knowledge and competencies of men in nursing rather than on gender." While the OCN poster campaign, and many other similar initiatives in the past decade, challenged men to be "manly" enough to choose nursing, the AAMN wanted to minimize the gender image and accentuate personal interests. In the fall of 2010, the 20 X 20 Choose Nursing campaign was officially approved by the AAMN board and presented at the Institute of Medicine (IOM) and Robert Wood Johnson Foundation Future of Nursing Summit in Washington, D.C. The AAMN named the initiative "20 X 20 Choose Nursing" to highlight the goal of increasing the enrollment of men in nursing programs nationally from the current 10% to 20% by the year 2020. The campaign encompasses the following three phases. "Do what you love and you'll love what you do." That's the theme and thinking behind the 20 X 20 Campaign poster series. Each poster also bears the call to action "Nursing: Come Join Us...We've Been Expecting You." Through these posters, the AAMN hopes to impart to males of all ages that the variety of nursing opportunities is virtually limitless and can coincide with their personal interests. Each poster creates a call to action in several ways. By featuring real nurses doing relatable things, a connection is established between the viewer and that nurse. The viewer is then encouraged to learn more about the person in the poster by going to the "20 X 20 Choose Nursing" link of AAMN.org, to solidify the connection the poster has made. In addition, the poster invites the viewer to learn more about nursing in general. The target audience includes school children of all ages, young adults looking for a direction in life, and second career adults who "wished they thought of a nursing career the first time." The "Adrenaline Rush" poster features Patrick Hickey, R.N. B.S.N., M.S., M.S.N., Ph.D., C.N.O.R, a world-renowned mountaineer who has climbed the seven highest summits in the world, including Mount Everest. He is also a clinical assistant professor of nursing at the University of South Carolina in Columbia. Hickey began his career with an entry-level nursing diploma and continued his education by obtaining a master's degree in nursing and a doctorate in public health. His personal motto says it all: "If I can do it, you can do it too." Hickey's fascinating life story and evident determination make him an excellent role model for any man considering nursing. Links on the poster allow interested persons to further investigate male nurses in two ways. The first is through a "Meet the Nurses" page in the 20 X 20 Campaign section of AAMN.org. Each nurse featured on a poster will have a brief bio posted on this webpage, along with responses to interview questions. Questions include "How did you decide to become a nurse?" "What did your family and friends say when you told them you wanted to be a nurse?" and "What do you like best about nursing?" The second is a Frequently Asked Questions page, with general nursing questions and answers. Examples include "How do you pick a nursing program?" "What types of courses will I take in a nursing school?" and "How many men are in nursing today?" By September 2011, the AAMN will have officially launched a new social media campaign, including a YouTube channel with video content about men in nursing. Under direction of AAMN board member Brent McWilliams, the YouTube channel will focus on the power of positive images and stories that show men can be—and are—nurses. "My personal experience as a parent has shown me that, often, kindergarten and first grade boys and girls do not think it is possible for boys to grow up and become a professional nurse based on gender alone," says William Lecher, President of the AAMN. "These beliefs are often perpetuated through the high school years." The AAMN will also launch a video contest through the YouTube channel, open to anyone with an interest in telling their story about men in nursing. McWilliams notes that "in offering video of men who are nurses through the AAMN YouTube channel, we hope to provide society with a new and fresh mind's eye view of professional nursing. Social media has become part of the fabric of our society and a vehicle for professional organizations to listen and learn, build relationships, increase visibility, provide expertise and serve as a platform to ‘take action' (like fundraising). AAMN plans to take advantage of YouTube, LinkedIn, Facebook, and Twitter to further our goal of increasing gender diversity. If adolescent males begin to see themselves in the role of professional nurse, we will be assured of meeting our 20% of men in nursing by 2020 goal." The AAMN Foundation, a separate arm of the American Assembly for Men in Nursing, is devoted to raising money and offering scholarships to men in undergraduate and graduate nursing programs. The funds are raised via individual and corporate donations. One very supportive organization in this endeavor has been the Robert Wood Johnson Foundation, which provided $10,000 annually and a total $50,000 to fund nursing scholarships. In 2009, 16 pre-licensure and four graduate students were awarded scholarships. "This year the board is pleased to announce that the Foundation will support 10 $500 scholarships," says Bridget Nettleton, President of the AAMN Foundation. "One of these scholarships will go to each of the 10 ‘Best Schools or Colleges for Men in Nursing' previous award-winning schools. Each school will then select their recipient of the scholarship." In addition to these scholarships, the Jadeh Marselis-Moore Student Nurse Essay Contest, established in 2007, offers a $500 unrestricted award to a pre-licensure nurse. Since 2004, the Awards Task Force of the AAMN has reviewed submissions from nursing programs and workplaces across the United States wishing to be recognized for significant efforts in recruiting and retaining men in nursing, in providing men a supportive educational environment, and in enlightening faculty, students, and the community about the contributions men make to the nursing profession. "Our efforts are essential in supporting the 20 X 20 Choose Nursing campaign because it provides the present workforce with the reassurance that nursing continues to strive to be diverse," says Ryan Lewis, AAMN Awards Task Force chairperson. "We must keep the passion alive—nursing is a man's work too—and our efforts to recognize and support specific organizations committed to promote men in nursing through integration of curricula, public relations, mentoring, advertisement, and positive role modeling is an important component of this validation." Coordinating with other nursing and non-nursing organizations is an essential aspect of the 20 X 20 Campaign—breaking down societal barriers can't occur in a vacuum. The AAMN has already partnered with the DAISY (Diseases Attacking the Immune System) Foundation to highlight men in nursing. The DAISY Foundation honors nurses for exemplary care, and male nurse DAISY award winners are recognized at a rate two to three times their prevalence in the workplace. Other cooperative plans include supplying a downloadable toolbox for high school guidance counselors, career advisors, AAMN members, and other interested parties to use when recruiting men into nursing programs. Local chapters of the AAMN will be encouraged to disseminate campaign-related information to their members and to create speaker panels to visit schools to talk about nursing as a career for men. The AAMN will also exhibit at national conferences throughout the year and will feature the 20 X 20 Campaign in those presentations. At the IOM Future of Nursing Summit, the AAMN board identified and approved metrics to demonstrate campaign progress. The AAMN will actively seek academic and workplace partners to deliver on these metrics. The October 2011 AAMN annual conference theme is "The IOM Future of Nursing: Men Leading Change, Advancing Health." At this conference in Lexington, Kentucky, the AAMN will staff an exhibit featuring the 20 X 20 Choose Nursing Campaign and offer a symposium describing how people can use the 20 X 20 Campaign materials for recruitment and retention. This meeting will be video-recorded and posted on the AAMN YouTube channel to allow those unable to attend to participate in the campaign as well. The American Assembly for Men in Nursing has established a number of particular goals, which it hopes to accomplish and evaluate before the culmination of the 20 X 20 Campaign. From September 2012 until August 2017, the AAMN hopes to be able to produce the following: 15 nursing schools with a 20% male enrollment and retention/graduation rates at 90% or higher; 10 hospitals with a nursing workforce of at least 20% men and retention rates of at least 90% for three consecutive years; and 10 long-term care employers with an RN/LPN/LVN nursing workforce of at least 20% men and a retention rate of at least 90% for at least three consecutive years. "The AAMN will not be able to impact on gender inclusion and balance in nursing by ourself," says AAMN President Lecher. "We will need to partner with other minority nursing organizations. We need the engagement and support of our women nurse colleagues. Patients, families, and others will be important in changing the culture and outcome. Avenues of dissemination, inclusion, and alliances are now in the process of being formed in order to spread the word about men in nursing." "Getting Tough About Recruiting Men into Nursing." Minority Nurse. Summer 2003. Rambur, B., Palumbo, M. V., McIntosh, B., Cohen, J. & Naud, S. (2011). "Young Adults' Perception of an Ideal Career: Does Gender Really Matter?" Nursing Management. Spring, 19–24. Used with permission from Minority Nurse magazine and MinorityNurse.com.